Let us help you produce your musical dream! and want to record your cover or original music sounding like a full live band? Do you need custom original music for your film or video, or advertising music/jingle for your commercial? Genres that we work with include indie, singer-songwriter, folk, pop, pop rock, rock, vocal, and instrumental music. Our music has been compared to The Turtles, The Beach Boys, Harry Nilsson, Simon & Garfunkel, Queen, Elliott Smith, Elvis Costello, The Kinks, Paul McCartney, The Hollies, The Beatles, Traveling Wilburys, Oasis, The Who, Electric Light Orchestra, and Wilco. We work with people in Las Vegas in person, or around the world through the web. 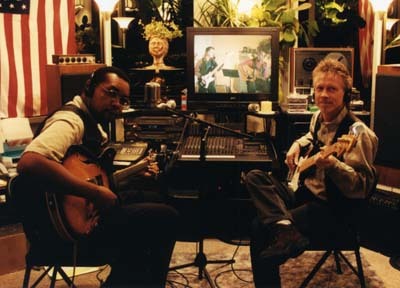 Alex & Roy in a past version of Trimordial Studio with Tascam 8-track cassette recording -- over 10 years ago (above). Current 32-track Mac / Pro Tools Trimordial Studio Las Vegas (below). "Ghost Riders In The Sky" cover song performed by Chuk Peña and TriPops Music Production in 2015. Recorded, mixed, mastered, and song cover art by Trimordial Studio Las Vegas. 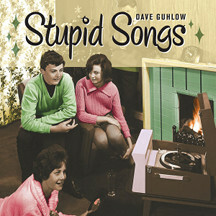 TriPops helped Dave Guhlow record his album Stupid Songs. Dave says it is 12 original (& stupid) comedy songs about everything from boogers to quantum mechanics to an annoying Christmas song. Some kid friendly, some for very warped adults, & some definitely not for grandma (unless she's very warped). You can hear song previews or buy the songs or album at CD Baby. Sample some songs that started with just words & melody from Lory Larsson aka Lola Halema. TriPops created, performed, & recorded the backing music. Pink Floyd's "Wish You Were Here" cover. Vocals by Debbie D, guitar by Doug. Video & all other instruments by TriPops. "Hash House A Go Go 1" video ad with original music & voice-over by Poppermost. Pink Floyd's "Lucifer Sam" cover video, vocals, & instruments by Poppermost. Cat Stevens' "Here Comes My Baby" cover. Vocals by Pattie Noah (from Orlando) & Alex. Video & all instruments by TriPops. Springs Preserve "My Preserve Escape" video contest winner! Video, vocals, & instruments by Poppermost. Poppermost's "Duchess" music video. Video & original song by Poppermost. "Key West 'Cinnamon Sunshine.'" Photos by Roy Rendahl, Trimordial Studio. Original song by Poppermost. Poppermost's "All About You" with Annoula & Roy. Video & original song by Poppermost. Poppermost's "Where the Guilty Prayed" music video. Video by Trimordial Studio. Original song by Poppermost. Alex Oliver & Roy Rendahl, members of TriPops & Poppermost. Alex is our very talented "musical brain" producer -- composing, arranging, singing, and playing multiple instruments in multiple genres. Alex can write music to your words or put words to your music; or he can collaborate with you on writing and arranging your songs; or he can write and perform complete songs for you. Alex also gives music lessons and coaching too. We can help you write, perform, and record your own original or cover music, or we can write, perform, and record brand new music for you for any use that you might require: quick singer-songwriter demos to finished mastered music albums with artwork; TV or radio advertising jingle music; and film, movie, or TV song placement, and song or full soundtrack composition. We can work with you in person or by easily sending files back and forth over the web anywhere in the world. We don't use MIDI programing, loops, beats, or "canned" music. We play and record all our instruments live by hand (although we do use a metronome). And we don't use Auto-Tune either, we work to get the best natural vocal performance. Alex and Roy are also the music and tech behind the popular Poppermost pop rock music band based in Las Vegas, Nevada, USA. Contact us to set up a free initial consultation to meet us and see our studio. • $300 - for a simple recording with 1 vocal track and 1 instrument track. • $400 - for a live band sound with 1 or 2 vocal tracks and basic guitar or keys, bass, and drum tracks. • $500 - for a professional production with lead vocals and back up vocals, basic instrument tracks listed above, plus other live or synth instrument tracks as needed. Songs over 10 minutes long will have an extra charge. We don't require a deposit before starting work, but we do require payment in full before the release of any product. If you cannot come into our studio to preview our work, you still have to pay for it before we send you any files. The above pricing includes up to 2 changes to the final product. Further changes will have an extra charge. Music lessons, coaching, or co-writing sessions are $25 per hour. We accept payment in cash or by check. We accept credit cards only through PayPal.com. You may deduct 10% if you book and pre-pay for 3 or more songs. Please add 5% if you pay us through PayPal.com. Working at your location or other outside studio location is $50 per hour for production time plus $50 per day, with possible additional charges for extra equipment, travel, and material costs. A deposite of $100 is required for location work. Video production and graphic arts work are priced separately. Our instruments include: Fender Stratocaster electric guitar, with Zoom multi-effects pedal, Martin Sigma acoustic guitar with built-in bridge pickup; banjo, Fender Jazz bass and classic 1969 Allied Radio bass guitars with Gallien-Krueger 100w 1x12” studio bass amp, Yamaha DTXPRESS III Special Edition electronic drum set, Yamaha DJX, Casio CT-625, and Casio MT-540 synthesizers, and a few assorted acoustic percussion items like tamborine, maracas, shakers, etc. Scroll down for studio information. Roy is the "technical wizard" with many years of experience, starting as a musician playing electric bass guitar in many rock, pop, old R&B, and country bands; and also as a visual fine and commercial artist. 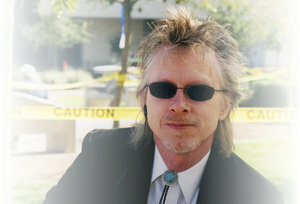 Roy later added audio engineering, recording, and song mastering; and also video production and web design to his repertoire. Contact me to set up a free initial consultation to meet me and see my studio. Trimordial Studio Pricing: Basic studio rate alone (without TriPops music production) is $25 per hour, plus extras, like materials. Mastering that is part of a recording or mixing project is priced at the normal studio charge of $25 per hour. Pricing for stand-alone mastering is per song up to 5 minutes in length (plus $5 for each additional 5 minutes of playing time for each song). The 1st song is $75, the 2nd song on up is $50 per song (all in a single project). Location or outside studio costs are higher and a deposit may be required, please see Trimordial Studio for more details. Studio and Location Audio Recording, Live Sound Engineering / Recording, and Song Mastering: I can record 2 tracks (or 1 stereo track) at a time using Digidesign Mbox with Focusrite mic preamps and building up to 32 tracks in Pro Tools LE on Apple MacBook Pro laptop in our small 15’x22’ studio, or your studio, or out on location in Las Vegas or elsewhere. I usually record 24 bit at 44.1 kHz sample rate, but I can record 48 kHz (for video), and I can record at or convert to 16 bit audio (for CD). Mics: Shure: SM58, SM57 (2), SM81 (2), 585 Unisphere A (2), classic Unidyne 55S, classic American D4T; and Electro-Voice: PL80 and classic 667A. Samson stereo direct box. Headphones: Shure SRH840, Sennheiser HD425, Sony MDR-7506, Koss Pro / 4AAA Plus, and Audio-Technica ATH-P5 (4). Power: Carver PM-600 600 watt magnetic field amplifier, and Furman voltage regulator / power conditioner. Speakers: JBL 10” three-way studio monitors, iKEY 6.5" 2-way bi-amplified 90w near-field monitors. Output Formats: MP3, AIF, WAV, CD, and DVD. Live sound engineering: with optional outboard effects racks (compression, EQ, delay, exciter, and reverb). Location Video Production: Equipment includes my small, portable Sony TRV900 MiniDV digital video camcorder (720x480 SD) with 3 sensor chips (380,000 pixels on each chip with 500 lines of horizontal resolution) in 4:3 normal or 16:9 wide screen aspect ratio, battery or 120v powered. Mics: camera-mounted mono shotgun or stereo, wired hand held, or wired lavaliere. I can shoot hand held with image stabilization or on a tripod; or with an optional portable 2 1/2 foot high shooting platform. I am able to record time-lapse and regular video directly into my MacBook Pro laptop computer. I can also shoot casual HD compressed (1280 x 720 MP4) video with a little Flip UltraHD camera with built-in stereo mic. Editing is done on my 15" MacBook Pro, with Apple iMovie HD, iDVD, QuickTime, and other programs; and saved to DVD, CD, or as QuickTime files; or uploaded to YouTube, Vimeo, or other web video. Graphic Arts; Photography; and Website Design, SEO, and Hosting: Using GIMP (GNU Image Manipulation Program), KompoZer (web authoring program), and NeoOffice (office application suite) on Apple MacBook Pro laptop. Olympus 35mm film camera with 35-180mm lens. 250,000 images of clip art and stock photos. File Output: JPEG, GIF, PNG, TIFF, and other formats. Graphic Input / Print Output: Epson Artisan 725 print / copy / scan has 6-color Claria Hi-Definition dye ink with up to 5,760 x 1,440 dpi print resolution and up to 2,400 dpi optical scan resolution. Prices, Specifications, and Services are subject to change and availability, without notice. Your satisfaction is guaranteed. Final product will NOT be released or published until the account is paid in full. You may pay by credit card only through PayPal to trimordial@thefaro.com. A deposit may be required to book a project. Partial or delayed release may be necessary if payment is by personal check. $25 charge for any returned checks. Please make all checks payable to either "Roy Rendahl" or "Alex Oliver." Bookings are available 24/7/52 in Las Vegas, in Nevada, or around the USA. TriPops Facebook page - Post your music photos, news, and events. 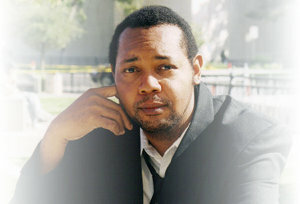 We are listed on ProductionHUB.com in Music Composition / Composers / Musicians in Las Vegas, Nevada. We have our TriPops music songwriting collaboration, creation, and recording service listed on Thumbtack.com. See our Huge List of Las Vegas Live Music Venues and also see our Huge List of Music Promotion Websites. Do you write songs? You'll find great songwriter info at Addicted to Songwriting, which includes interviews, links, and articles on songwriting. Songwriting Tips & Tools - The Muse's Muse - Songwriting tips, tools, interactivities, and opportunities to connect with other songwriters. Also see the Singer/Songwriter Directory for more resourses. Singer Song - Singers/songwriters resources. Stars & Catz Music Teacher Network Australia - We help students and parents by offering a free teacher matching service. A&R Online - Music Marketing Resources - Record deals, A&R contacts, music marketing, and promotion. Musicians & Fine Artists for World Peace - A network of musicians, artists, and performers working to promote events and concerts focused on peace and raising global consciousness. Visit our TriPops Music Production page on Gig Salad. Music Industry Links - Find music businesses and artists. Advertise to targeted visitors in the music industry link directory. Get songwriting tips, music production info, management insight, and increase your music business knowledge at MusicU. Location & studio audio recording & song mastering; music restoration, creation, & production; and sound engineering. Location MiniDV video production. Graphics, fine & commercial art, and 35mm film photography. Web design, website hosting, and SEO (search engine optimization).